This information document is not legal or financial advice and has not been prepared to be either. It has been prepared to consider hypothetical opportunities and to investigate and comment upon the potential for changing existing land use zonings for value uplift purposes. Coldstream is an amazing area that has been “left behind” whilst the wider Melbourne community has grown and benefitted from urban planning and sprawl. Coldstream has incredible untapped potential to provide a quality lifestyle for many people however its current boundaries prevent it from being appropriately utilised. Rezoning a large tract of land to enable increased population and improved facilities will benefit the entire community. Improved services and facilities plus a phenomenal lifestyle can be created but only if the population of Coldstream supports the proposal. Substantial tracts of land around Melbourne have been rezoned however Coldstream and its surrounds have been ignored despite the lifestyle potential, the existing infrastructure and the apparent desire of the greater community for improved facilities. LEFTA are development experts. Through our network of contacts, we were approached to provide the necessary guidance and services to rezone land at Coldstream. Initially we sought to identify whether there was general interest in rezoning land and, as there was substantial interest, we have prepared this information document and are hosting this meeting. Should the property owners wish to proceed with the proposed rezoning LEFTA would undertake the lead consultant role, providing strategic direction and managing the consultant team for the rezoning process to completion. A Heads of Agreement (“HOA”) will need to be created that establishes the basis of the legal agreement to be entered into by the property owners. The HOA is a non-binding document that simply identifies the terms and conditions intended by the parties for inclusion in a legal agreement that is subsequently enter into by the property owners. Once all property owners have signed the HOA a legal firm will be selected to draft the Land Owners Co-Operation Agreement (“Owners Group”). The project will be delivered in stages with subsequent stages only progressing if the preceding stage is successful. A project budget has been prepared that reflects the various stages. Section 7 of this document provides a summary of the decisions that the property owners need to make. In effect the property owners simply need to decide if they are willing to participate in a potential rezoning to obtain the value uplift for their land. Over the past few years a small group of residents have been lobbying Council to rezone a small area of land adjacent to the primary residential area of Coldstream. As a result of the lobbying, in March 2016 the Coldstream Structure Plan was released (extract below). The Coldstream Structure Plan will result in slight improvements to the primary area of Coldstream over a 10 to 15 year period, if the timelines within the Structure Plan are adhered to. Allowing some contingency for unforeseen circumstances, this is likely to be a 20 year objective. 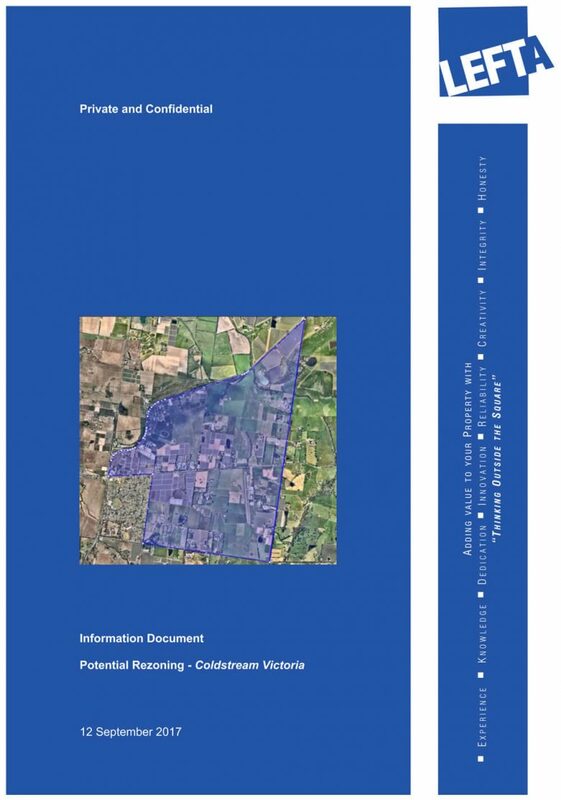 It appears to LEFTA, as property development experts, that Coldstream has far more to offer than what the Coldstream Structure Plan proposes. We envisage a substantial area of land being made available for new residential and commercial development, with a new and enlivened town centre to support an increased population and growing tourism in the region. To be able to achieve this a substantial amount of land must be rezoned as indicated above. And when land is rezoned, it undergoes an uplift in value, usually quite substantially. An amendment to the planning scheme being completed. You, the landowners of the land to be rezoned. To achieve the desired outcome there is a requirement to engage a number of expert consultants to create reports and relevant documentation to support an argument for rezoning. This requires an investment to be made to achieve the rezoning and the resultant value uplift. The formation of a formal Owners Group. This may sound quite daunting, but not to us as this is what we do. We will assist you through the entire process from the above “next steps” all the way through to helping you receive your value uplift. To commence the project the property owners must enter into a legal agreement with each other. This agreement will govern the manner by which the process proceeds and how the process will operate. The first step in achieving this is to agree the basic terms of such an agreement. The Heads of Agreement (“HOA”) between the property owners will need to deal with the various components of the process from creation of the initial HOA to sale and settlement of the land to property developers. Prior to commencing the legal drafting of the HOA, we will prepare an HOA document that proposes the basics of the agreement including LEFTA’s engagement. Representing the Owners Group in negotiations with property developers for the sale of land. The project must be undertaken in stages to achieve the ultimate goal to sell rezoned land to a property developer/s. Prior to commencement of the project, a strategy must be prepared and instigated for community information dissemination and for garnering widespread support. This stage requires community research, preliminary studies of the subject land and surrounds, concept design, and economic impact analysis to determine the necessity for, and viability of, rezoning land to support the expansion of the urban area within and surrounding Coldstream. Community support will be essential to the success or failure of the project at this time. The community strategy will be implemented and functioning at this time. The Owners Group will be responsible for liaising with the greater Coldstream community to inform them of the benefits that will be created by the proposed rezoning. Similarly, the Owners Group will be responsible for maintaining communication with the local councillors and state members of parliament regarding the desire to rezone the land and to ensure they are aware of the greater community benefits that will occur as an outcome of future development. Although LEFTA will be liaising with the relevant authorities and politicians, it is the voting public (the property owners) that will have the greatest impact upon the politicians. An ultra-high level (concept) rezoning proposition will be created to reflect the intent of the Owners Group. In creating a concept rezoning proposition some land owners may feel that their land is being underutilized or allocated a non-valuable use. The distribution of revenue will be calculated over the entirety of the land holdings ultimately approved and distributed on an even basis as a parcel of land zoned for residential land subdivision cannot be developed without land zoned for parks, community services or water quality. Political support must be obtained at all levels of government on a bipartisan basis to facilitate the seamless transition of land from one zoning to the next including the initial relocation of the urban growth boundary. At the completion of this phase the urban growth boundary (“UGB”) may be relocated. The relocated UGB (“New UGB”) may exclude some land areas and land holdings from the initial Owners Group property owners’ holdings. Where this occurs, those owners of land parcels excluded from the New UGB will be removed from the project. Any costs incurred by the excluded land owners will be reimbursed by the remaining land owners. Where the New UGB is moved outwards and includes more land holdings, those affected land owners will be invited to join the Owners Group. Upon completion of the Peri-Urban process (required to create the New UGB), a Precinct Structure Plan (“PSP”) must be prepared to allocate certain proposed zonings over the land within the relocated urban growth boundary. It is not envisaged that there will be any excluded land owners from the PSP stage as the New UGB will have already been defined. If the authorities require any further amendment to the New UGB that creates additional excluded land owners, they will be treated in the same manner as those in the Peri-Urban stage. Where additional land is added back into the rezoning area (i.e. the New UGB is moved outwards), such land owners will be invited to join (or re-join) the Owners Group. At completion of the PSP stage the relevant authorities will have reviewed and confirmed their acceptance of the proposed zonings and land uses, and of the methodologies for infrastructure servicing the entire precinct to be rezoned. Upon completion of the PSP it will be necessary to undertake the actual rezoning process, called a Planning Scheme Amendment (“PSA”). The PSA should include all land owners covered by the PSP. This process requires a more detailed break-down of the PSP areas and creates development controls that will apply to all lands within the New UGB that the property developers will lodge permit applications upon. This is the final stage of works that the Owners Group must undertake to complete the process. As the process proceeds through the various stages, property developers will hear about what we are doing and will start to express interest in acquiring parcels of land to developed. We believe it will be in the best interests of the Owners Group to wait until the PSA stage and to then promote an Expression of Interest (“EOI”) process to the property development market. By waiting until the PSA stage before issuing an EOI to the market we are certain of the structure of the land its use and its zoning. We will have certainty regarding the actual zoning and the boundary (and therefore the area) of each zoned parcel of land. Before the PSA stage, if the Owners Group was to consider selling land parcels, it would be difficult to contract with any certainty regarding the extent of the various zones of land and their particular area. The sales contract would require all sorts of mechanisms for valuing land based upon the actual area of the various zones of land achieved after the PSA has been completed. Effectively, selling the land early to property developers still requires waiting until the PSA is complete before the sale can be completed. The only exception to this would be if a single property developer made an offer to purchase the entirety of the land in one transaction. LEFTA manages the rezoning process on behalf of the Owners Group and is paid a monthly fee throughout the project. Upon completion of the rezoning process and divestment of the properties to one or more property developers, LEFTA becomes entitled to a proportion of the value uplift achieved to be paid as a success fee. This success fee is not payable unless the rezoning occurs meaning that LEFTA is incentivised to ensure that the rezoning occurs. The project will be delivered progressively in stages. What this means is that costs detailed in the budgets will only be incurred progressively as each stage is completed. Following is a staged budget for the delivery of the proposed rezoning. LEFTA’s fees are included within the item noted as “consultants’ fees”. The first task to be undertaken is the preparation and execution of the Owners Group documentation. Initially LEFTA will prepare a HOA for each property owner to review and sign. Please keep in mind that the HOA is not legally binding and only represents a moral obligation for other parties to also commit to the preparation of the legal documentation that results in the formation of the Owners Group. There will be substantial liaison between LEFTA and the property owners and LEFTA and the lawyers preparing the Owners Group documents. As part of the Owners Group documentation it will be necessary to obtain valuations of all properties from a single independent property valuation firm to provide a base value case from which value uplift will be determined. The area identified within this document for potential rezoning totals approximately one thousand and twenty-seven (1,027) hectares. There are sixty-six (66) property owners within the nominated area. On a per-property basis the budget contribution would be three thousand one hundred and fifty ($3,150.00) each. On a per hectare basis this would be two hundred and two dollars and forty-three cents ($202.43) per hectare. Prior to appointment of the lawyers for this stage, all property owner contributions must be deposited into the trust account of the legal firm drafting the Owners Group documentation. Following the Owners Group formation, the rezoning process can commence. The first stage of the process is formulating a strategy and creating relevant documentation necessary to relocate the current Urban Growth Boundary. In preparing this budget we have been conservative in our outlook on the potential time it may take for this process to occur. Our budget is based upon a three and a half (3.5) year timeframe. On a per hectare basis the budget contribution would be three thousand two hundred and fifty-one dollars and fifty-eight cents ($3,251.58) per hectare. The Peri-Urban process is the most detailed and has the most extended duration of any stage. It is the most difficult stage and carries the most risk as should this stage fail there can be no rezoning. Should this stage be completed earlier than expected there are likely to be cost savings applicable to the budget. Prior to commencement of this stage, all property owner contributions must be deposited into the trust account of the legal/accounting firm. Following a successful relocation of the Urban Growth Boundary, the next stage is creation of a precinct plan that identifies, at very high level, what the proposed land uses will be within the newly relocated Urban Growth Boundary. In preparing the Peri-Urban proposal a substantial amount of the work required to be undertaken for this stage will have already been considered. Notwithstanding the advanced state of the documentation it will still be necessary to create the appropriate documentation to facilitate the precinct plan. The budget proposed includes a twelve (12) month period to prepare the precinct planning documentation and to have it approved. On a per hectare basis the budget contribution would be one thousand one hundred and seventy-two dollars and thirty-seven cents ($1,172.37) per hectare. As with the Peri-Urban stage, should this stage be completed earlier than expected there are likely to be cost savings applicable to the budget. The Planning Scheme Amendment is the final process required to complete the rezoning process. 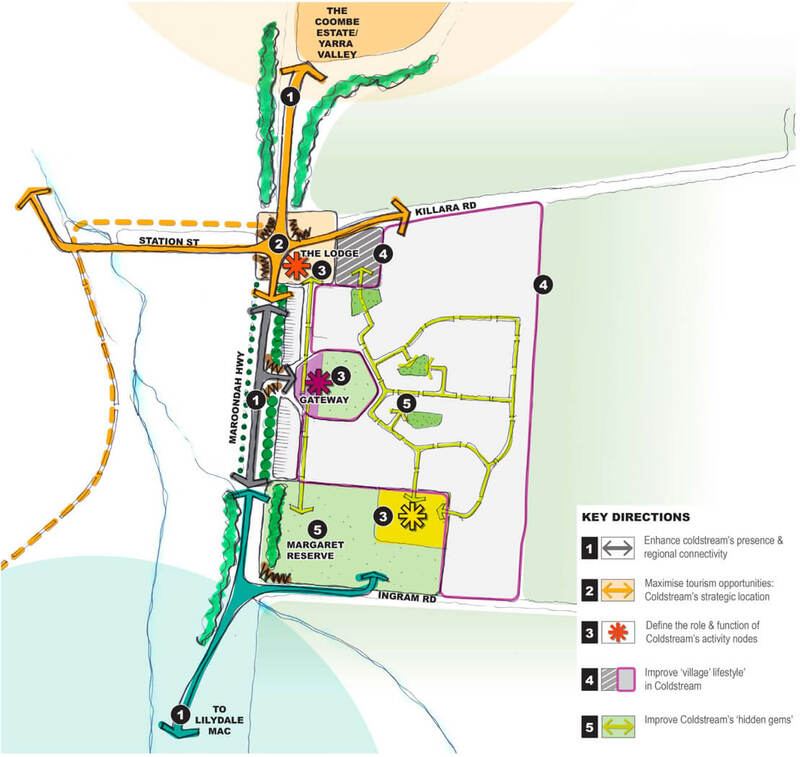 In this stage, the precinct plan is further dissected and detailed planning of the various zones within the new Urban Growth Boundary are explored with various design and development overlays formulated. The budget proposed includes a twelve (12) month period to prepare the planning scheme amendment documentation and to have it approved. As with the precinct plan stage, should this stage be completed earlier than expected there are likely to be cost savings applicable to the budget. 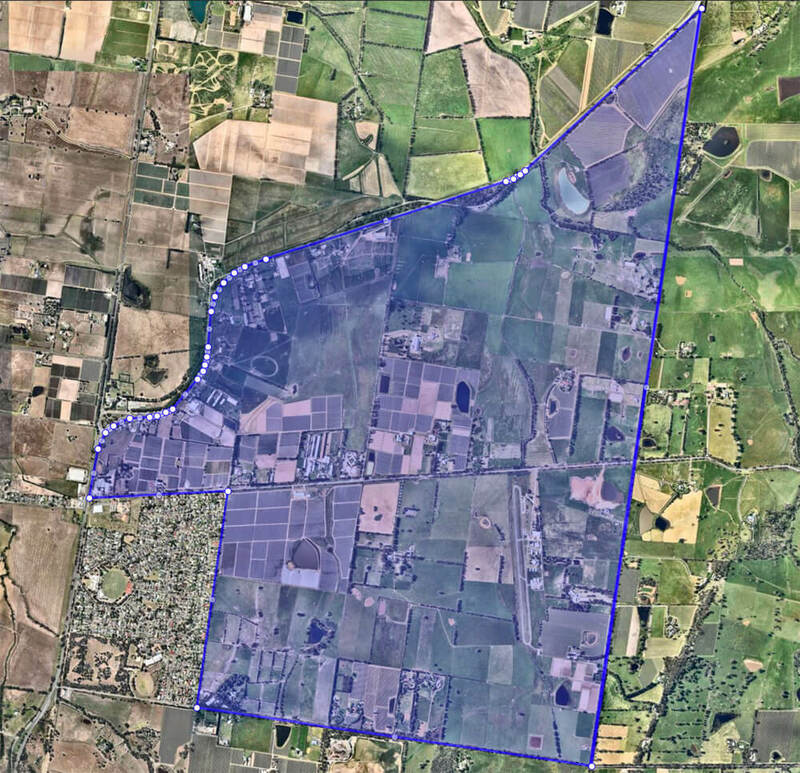 The recent sale of approximately three hundred and sixty-three (363) hectares of land in Wyndham Vale VIC for a reported four hundred million dollars ($400m), as reported in the Australian Financial Review on 10 July 2017, equates to approximately one million one hundred thousand dollars ($1.1m) per hectare and provides some guidance on the potential value uplift that can be achieved with rezoning. On a per hectare basis the budget contribution would be six thousand three hundred and ninety-one dollars ($6,391.00) per hectare. Commence Stage 1 (Peri-Urban process to relocate the Urban Growth Boundary).